To reduce ill effects of Sun, cure heart and spine related ailments, indigestion, fatigue etc. Belmool, also known as Aegle Marmelos is associated with the Sun God or Surya Deva. Sun signifies power, optimism, warmth, honour, success, energy and being a champion. These being the positive effects, let's take a look at the negative effects of Sun, they are bad behaviour, arrogant, misleading, jealousy, anger, trouble with family and friends. So, the Bel mool is used to decrease the negative effects while simultaneously increase the positive effects of the Sun or Surya. The jadi should be used in the following manner, wrap the jadi in a pink cloth or thread and tie it to your right arm (preferably upper part of the arm). Bel mool also helps in curing the diseases caused by the ill effect of Sun, they being heart and spine related ailments, indigestion, fatigue to name a few. Q1. What is a Jadi? 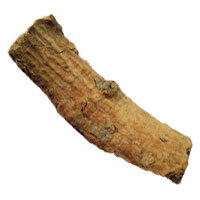 Answer: Jadi, also called a Plant Root, can be used as a substitute in place of gemstones according to astrology. It can be worn to pacify malefic effects of planets and overcome physical illnesses and disorders. Wearing these roots appease planets in many ways, leading to a gradual change and peace. Jadi roots prove to be more effective than other rituals in Graha Shanti procedures. Each planet symbolises a Jadi and comes with a wearing process. For more details, you can contact AstroSage’s esteemed astrologers and consult them over which Jadi can be beneficial for you. Q2. Can I return the Jadi if not satisfied? Answer: Sure. At AstroSage, we aim at providing best services and products without any fault and strive towards achieving satisfactory results. Our product category “Jadi” consists of various types of roots in different types, materials, weights, colors and uses. If any of our product doesn’t meet your criteria, you can definitely return it back to us within 7 working days. Contact our customer care executives and provide them with your Order ID & reason of returning. Read our return policy for more information. Q3. How can I wear the Jadi? Answer: Jadi roots are nature’s gift for us, and astrology describes a good use of it for natives’ welfare. It must be worn as advised by the astrologer, otherwise you might not attain good results as desired. While placing an order at AstroSage, we provide you a quick description of the Jadi, the ruling planet, its benefit and process of wearing. One can wrap it in a cloth and wear around the wrist, arm or as a locket. Q4. What makes the Jadi on your website special? Answer: AstroSage promises to deliver high-quality and certified products on its website, and offers satisfactory results. Our Jadi tree roots are examined from every angle, in regard with the material used, color offered and methods of wearing them. Our products are known nationwide for its authenticity and capability to deliver desired results. Some days back I ordered the Anantmool Jadi from AstroSage for my kid, as he suffers from a certain skin-related disorder. After purifying it (as told by the customer care executives), following the process and wearing it, we started observing drastic improvement in his health. I am really thankful to AstroSage! Good work! AstroSage was true to its words, as what they showed and offered turned out to be exactly the same. The executives were very helpful in making me understand the policies and astrologers helped me figure out which jadi can be beneficial for me. Thanks AstroSage. I placed an order for Dhature ki Jad on AstroSage, and the delivery was on time. There was no delay, and the mode of payment was very secure and easy. It is miraculous that after wearing the jadi as instructed on the website, I gradually saw improvement in my life, both physically and mentally. I am thankful to AstroSage! After intense browsing and searching for high-quality Nagarmotha Root, I finally came across AstroSage. My order was delivered as mentioned by the executives, and the product was of high-quality as depicted. I was even advised by the astrologer on how to purify and then wear it properly to gain maximum benefits. Even the prices are so reasonable. Great job guys!